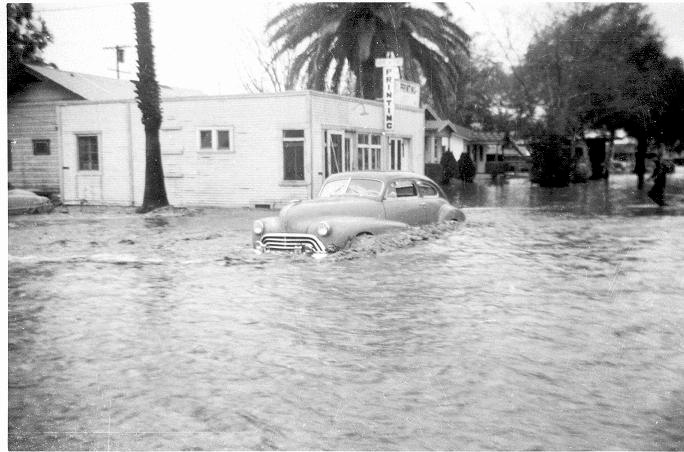 Flood: Van Nuys, CA, originally uploaded by Here in Van Nuys. “Wow, what a cool picture! That little shop on the corner is my grandfather Frank Preimesberger’s Van Nuys Printing shop. He started the business in 1942 after moving to Van Nuys from Pierz, Minn. The business was passed to my uncle Lee Preimesberger in the 1960s, and he ran it until his death in 1993. Grandpa and Grandma lived on the corner of Hazeltine and Emelita for 40 years, and they both died in 1982. Also printed all the league bowling sheets for the bowling alleys in the valley. Had many conversations with “Rhiney” P. as a junior bowler at Van Nuys Bowl from 1956 to 1963. Reiny Preimesberger was my dad’s cousin and was REALLY into bowling. Wrote a bowling column for years about all the leagues for the Valley News & Green Sheet. That turned out to help me a lot, because when I graduated in journalism from Pepperdine in 1975 and went job-hunting, I didn’t have to go far, because everybody at the newspaper already knew my family name. Absolutely. My family’s shop was the go-to place for bizcards, posters, church bulletins, biz stationery, all that stuff for years and years. Uncle Lee was big in the Knights of Columbus and was a very social kind of businessman, very successful. We were all St. Elisabeth School grads — 17 kids alone from both Van Nuys Preimesberger families. Eight kids from my family (Julian and Cecilia P), and 9 from Uncle Lee and Aunt Loretta’s. The May Festival was the biggest deal at SES for generations. Cool memories! Double wow! If you went to St. Elizabeth and you needed printing… it was the Preimesberger’s you went to. Remember “May Festival” posters? ← Sign of the Times.